Ralph Breaks the Internet has earned laughs and plenty of forced drama and some entertaining set pieces to boot. It’s a good movie that’s unsurprisingly deeply observed, the kind of vehicle that can be driven by a novice on auto-pilot or a skilled street racer drifting between the wide-ranging appeal of the film’s massive audience age gaps. Yet at the same time the movie unenthusiastically tells its story about insecurity and co-dependency with hardly enough thoughtful consideration, and my most genuine misgiving was that this massive visual feast grew so exponentially while the characters remained so stagnant. 2018 has been a down year for animated films thus far and this one doesn’t amend the situation as much as I had hoped it would. Vanellope’s (Sarah Silverman) racing game suffers a broken steering wheel, leading the arcade owner to scrap the entire unit for parts. After all, the wheel alone costs more on eBay than the game profits in a year. 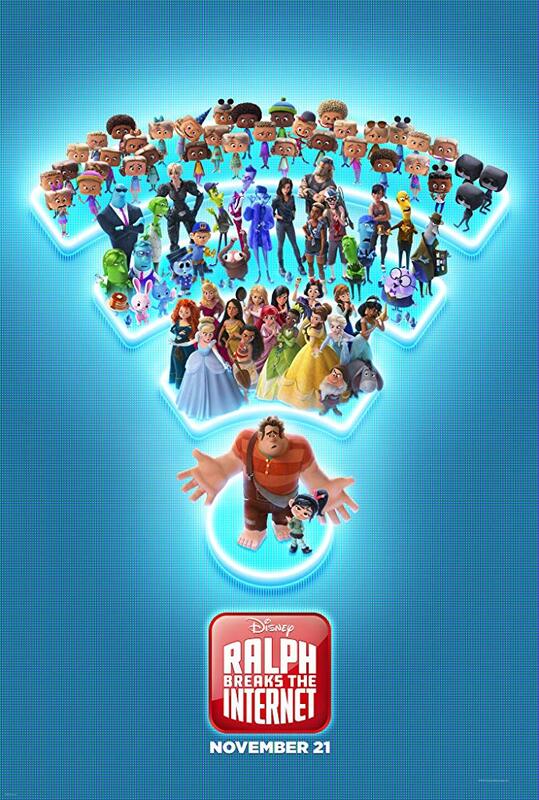 Ralph (John C. Reilly) wants his best friend to have a familiar place to call home though, so after WiFi finally gets installed alongside the rest of the games, it’s off into the internet they go. From there the film suffers from some severe pacing issues, especially in the abridged final act, but I can’t condemn the movie for dawdling around in this middle section either. Vanellope and Ralph are like pups playing in the snow for the very first time, getting lost in the newness of the world wide webwhere there’s plenty of material to mine a few big, easy laughs. Everything looks lavish and the picture certainly passes the eye test, yet I really don’t think Ralph Breaks the Internet has a very effective emotional narrative, perhaps due to the sheer volume of characters and material floating around in the polluted plot. And because the film is so dense and so bogged down by Disney product placement – the character arcs continually play second fiddle to any and every opportunity for self-promotion and corporate greed – the ending leaves a strange, lingering aftertaste. In a way, the movie seems to use the new additions to the story (voiced by Gal Gadot and Taraji P. Henson, respectively) as capable shills who get us to pour dollar after dollar into the studio’s behemoth piggy bank, except here we don’t receive our expected return on investment. Ralph Breaks the Internet considers a lot of big issues in a variety of small ways, none of which happens to be more memorable than Vanellope’s interactions with the wide-ranging sisterhood of Disney princesses. Only here does the Disney catalog add depth and build the story at hand, while other set pieces appear to exist solely as reminders of which studio’s made the picture. Ralph Breaks the Internet has half the heart of Inside Out, a fraction of the ambition found in Ready Player One, and too many similarities to the atrocious The Emoji Movie for its own good. Like most things on the internet, the film’s overall message get lost in a sea of sentimentality and a maelstrom of clickbait headlines ready to send you into oblivion.